Last month I went to a conference about the impact of the December 2015 FRCP proportionality amendments. The group included plaintiffs’ and defense counsel, in-house lawyers, and service providers. On the question of real-world change, plaintiffs’ counsel reported that so far their worries about undue limits on discovery haven’t materialized. Consistent with that experience, defense counsel said they haven’t yet seen the hoped-for benefits from the amendments. Part of the reason seems to be that many practitioners either don’t know about the changes or don’t have practical ideas to make them work. Interestingly, the proportionality conversation mostly focused on whether counsel were narrowing discovery requests in response to the amendments. In fact, it should be at least as much the producing party’s job to drive proportionality. Knowledge and control of the client data being produced put them in the better position to make informed suggestions. Besides that, they have the greater incentive to minimize cost and burden. Start with the custodians who are likely to be deponents. Work toward a schedule that makes room for phases, with time for the parties to digest the discovery provided to date and the incremental value of further discovery. If a requesting party raises concerns about delay, an interim end date for document production can give confidence that they will have the documents they need well before the close of fact discovery. Phase discovery, not just by custodian, but by relevance. Usually in negotiating phasing, we talk about groups of custodians. That’s understandable because until relatively recently, we didn’t have ways to quickly isolate relevant documents. The best we could do was to look for likely sources of relevant information. Now, using analytics, we have the means to understand the content of a data set and quickly find key documents. If you negotiate at the custodian level, you miss the opportunity to phase production in a more meaningful and targeted way. Analytics are also useful to confirm that the producing party conducted a reasonable search for responsive information. For example, a producing party might ensure that search terms worked by exploring concepts related to keyword hits, or use communication mapping to confirm that all necessary custodians were included. Statistical sampling can help settle a dispute over the importance or prevalence of relevant information in a specific data source. A few hundred documents provide a statistically significant sample of even a very large set. 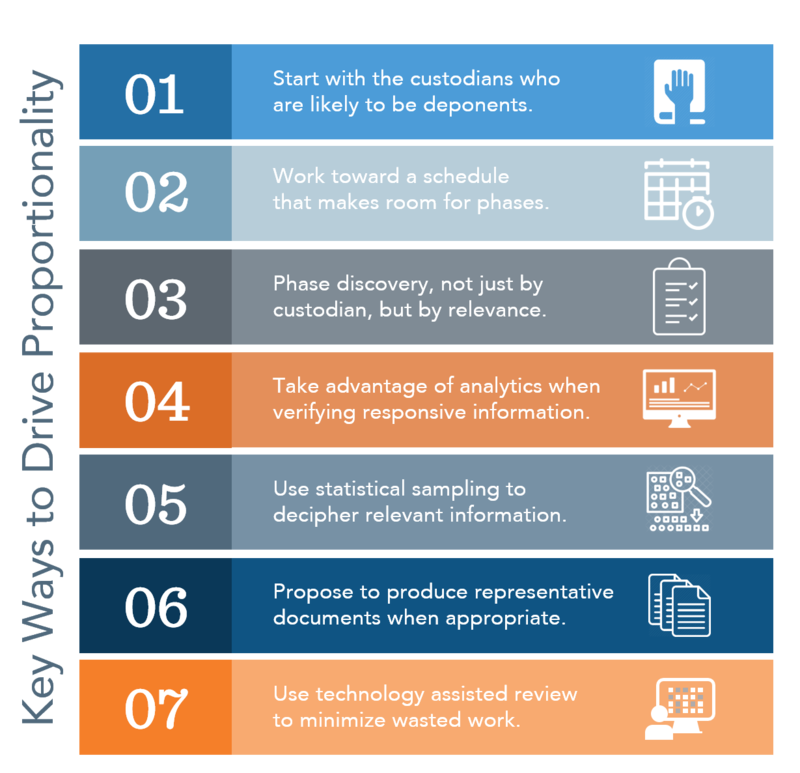 That relatively minimal burden gives the producing party flexibility to offer review of samples and report results with hard numbers. For instance, a party might sample to find the percentage of responsive documents among hits for a specific search term, or how much relevant material appears in a contested collection source. Use TAR to minimize wasted work. Surprisingly, even in this conversation among people who work in ediscovery every day, there was a lot of debate about how many search terms are reasonable and not much talk about more advanced technology. Your ESI protocol may specify a default number of terms. Don’t assume that ends the discussion of a proportional approach. The key takeaway from the day? To benefit from the new rules, producing parties have to take the initiative. Help yourself and the rules will help you too. To discuss this topic further or to ask questions, please reach out to me at lreilly@lighthouseglobal.com. Prior to joining Lighthouse, Lynn was T-Mobile's Senior Corporate Counsel for eDiscovery. As a member of T-Mobile's Major Litigation Team, she oversaw all aspects of T-Mobile's ediscovery, including setting policies and practices across cases and advising litigation counsel on the law, strategy and tactics of ediscovery. Lynn has over 25 years of experience as an attorney, including as a commercial litigator with Stoel Rives and as a prosecutor for the City of Seattle. Since 2001, Lynn has focused her legal practice on ediscovery. Lynn practiced for six years in the eDiscovery group at K&L Gates. She also developed the curriculum for and taught the University of Washington’s Continuing and Professional Education certificate program in ediscovery project management. She holds a J.D. with Honors from the University of Washington School of Law and served a judicial clerkship at the Seventh Circuit Court of Appeals.